This is a Taetea (aka Dayi) ripe cake. 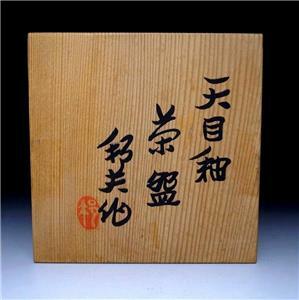 Produced by Menghai Tea factory in 2007, this Dayi (logo name) tea cake blend is call 7592. 4 digit names were commonly used especially by Dayi to name their teas. 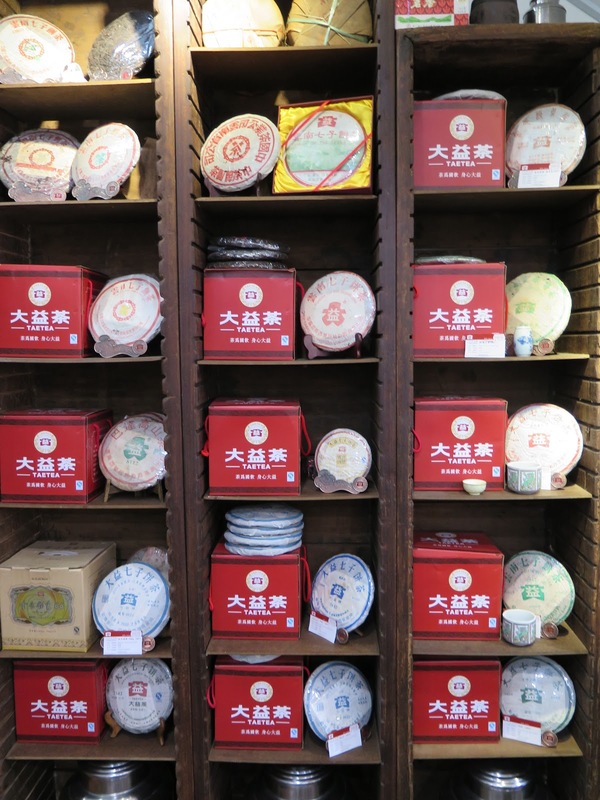 Some very popular dayi tea cakes include 7542, 8582 and 7572. This Dayi 7592 is a ripe cake. I had kept it in a large brown envelope and it had been sitting in my tea cupboard for about 6 years. I had taken pix of the cake to show you a few pointers of identifying a real Dayi. Yes, older or more expensive Dayi have fakes and I always advised my tea friends and readers if they are buying Dayi tea, to only buy from authorized retailers or from a reputable tea shop. Dayi wrapped their tea cakes in a unique way (see pix 3). The Dayi sticker and neifei changes with each year and you must know the characteristics of these labels. Newer labels will have special marking that will only show under a UV light. Back to this tea. This is a very traditionally made ripe tea cake, blended well and will satisfy the ripe tea drinker. One of the best Dayi cakes I had drank this year. Nothing fancy, just a very aromatic and smooth ripe tea that had me drinking this tea on a daily basis for the past one week. 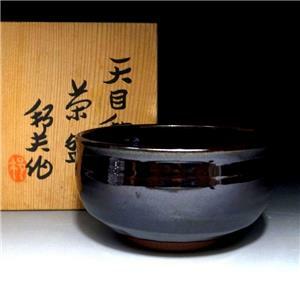 Chawan, aka Japanese tea bowls are mainly used in Japanese tea brewing of green matcha tea. The sides of the bowls are more upright, which helps keep the tea from spilling out of the bowl while the tea is being 'stirred' with a tea whisk. 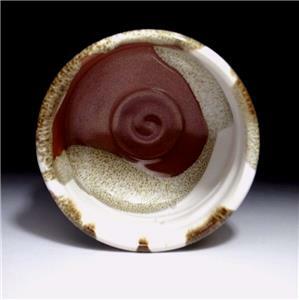 The Japanese chawan you see in the above pix are from my own collection. 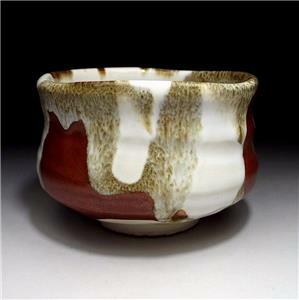 The 1st 2 bowls are made by Eichi Kato, who is known for his more artistic interpretation of his chawans. 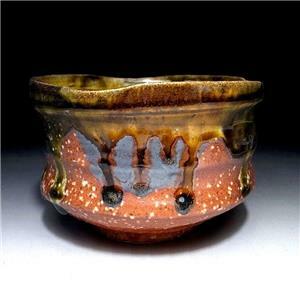 Height of these bowls are about 3.5 inches (8.8cm) in height and 4.5 inches (11.5cm) in diameter. 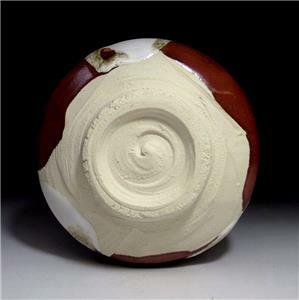 The last bowl is made by Kunio Uchida, a blue ribbon award winner for his contribution to Japanese pottery. The bowl measures 2.8inches (7cm) in height and has a diameter of 4.9 inches (12.4cm). These 3 bowls appear unused. 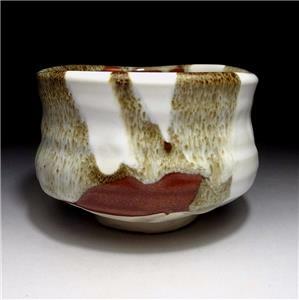 I am fascinated by Japanese chawan. Holding them and examining the details on the bowls is like going for an adventure. Nuff said. Let the pictures do all the talking. Oolong tea drinkers would tell you that the 4 most famous oolong varieties are Tie Lo Han, Da Hong Pao, Bai Ji Guan and Shui Jin Gui. Tea that are harvested from Wuyi Shan are highly sought after as these tea originated from this region and are considered to be of high quality. There are many other varieties of oolong that are enjoyed by the oolong drinking community and some of these oolong would include Rougui, Shui Hsien, Buddha Palm, Pan Shen Yao (aka half waist tea) and Chien Li Xiang (thousand mile fragrance). There are many other varieties of tea and I will try to introduce these oolong to my readers whenever I can lay my hands on them. One oolong variety is Yizhi Chun (aka a sprig of spring). Sea Dyke tea recently came out with a batch of these tea selling them in paper boxes containing 125g of Yizhi Chun in each box. Inexpensive. You will noticed that this tea is rolled and highly roasted. The rolled tea leaves, is appropriate in that packing the tea in paper boxes will see little damage to the tea leaves during transit. If the tea leaves were not rolled, a buyer would end up with a fair amount of broken leaves. I use about 9-10g of tea to a 150ml teapot. The high roast made this tea very aromatic, almost resembling coffee essence. It is very flavorful and makes this tea a value for money purchase. This tea is very good in both aroma and flavor. When I brew oolongs, I can appreciate the different nuances, the subtle differences in taste and character of each tea, but for this Sea Dyke Yizhi Chun, even though this is a very delicious high roasted tea, I could not detect any defining characteristic feature of Yizhi Chun from the tea session. Readers will know that I am a fan of Sea Dyke tea. Sea Dyke had been producing their oolong using traditional methods and their tea has been exported worldwide. Sea Dyke had recently came out with a premium series of oolong harvested from Wuyi regions which I am impressed. I will introduce these tea to my readers next year. But I digress….I will be in Toronto and St John NB during the Christmas week and if you like to have a tea session with me, please let me know so I can bring some tea for our meet up. Thank you. I had a family vacation last year and we went to the USA in summer. It was a memorable trip with highlights like Vegas (buying a special deal where you can dine at a number of restaurants, unlimited food for 24hrs), Disneyland, Santa Monica beach as well as my fav city, San Francisco. I like Frisco for number of reasons; wharfs, Sausalito, cable cars, steep hills, Mechanics Institute Chess room, great food and Chinatown. Chinatown here looked like old streets of Hong Kong. I saw stalls literally overflowing with fresh produce and everyone there was speaking Cantonese. It was really strange but the atmosphere captured the essence of an old Chinese street community. My family was delighted that the food here was pretty authentic in cooking style and it was a surprise that we had our most inexpensive meals there during our trip. I had time to explore the shops, even stepping into a couple of grocery shops in Chinatown and snagging some pu erh. It was inexpensive. The $8.99 tea cake was a Hong Kong pu erh cake by Hung Cheung Tai Tea Co, while the $9.50 tea brick was by China Tutsu (aka CNNP). Both were ripe pu erh tea. CNNP is a well known pu erh tea factory and this brick did not disappoint. I found the tea earthly and aromatic. I estimate the age of this tea to be around 3-5 years old. The Frisco humidity would have helped aged this tea. Pretty good, in my opinion. Tomorrow is Thanksgiving in the USA. One of my fav artists, Norman Rockwell painted a wonderful family reunion dinner. 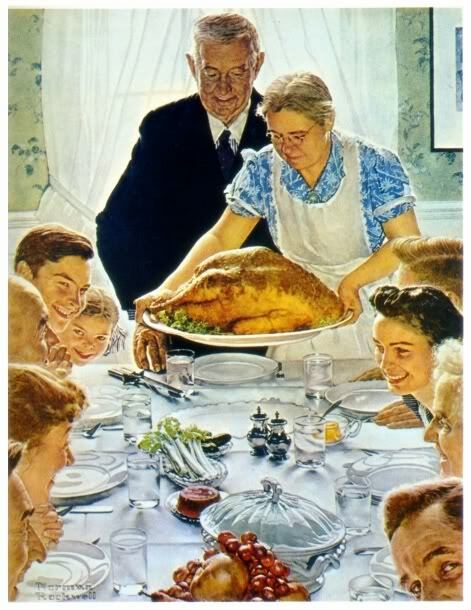 I wish all my American friends and readers a happy thanksgiving. This year's Malaysia tea expo was held from 12-16 Nov 2105 in the exhibition hall at Viva Mall, Kuala Lumpur. I was on a business trip in Malaysia and I managed to squeezed out a few hours visiting the tea expo on the 1st day. Noticed the large bamboo baskets in pix 2. These are the basket sizes that was used to shipped liu bao tea from China to Malaysia. Tea in these baskets would weigh up to 30kg or more. Some of these baskets were stored for many years (up to 40 years) in Malaysia. The liu bao tea had naturally fermented over time and today these Liu Bao tea had became a famous Malaysian tea that is sought by tea drinkers around the world. The last 2 pix was taken by my good tea buddy friend, Mr James Ong. James is my 'turn to' contact for tea in Malaysia. His in depth knowledge of Malaysian tea and his willingness to share his findings makes him an invaluable friend to have. Pix 4 shows James, having a personalized tuo cha made for him at the Xiaguan booth. The last pix shows some of my tea drinking buddies in Malaysia. But I digress…..My Ipoh tea expert friend in Ipoh Malaysia pointed out some errors in my previous Liu Bao tea blog. She mentioned that traditionally made Liu Bao tea is actually black tea, normally pressed into baskets and left to ferment naturally. I had written in my previous blog that that was a forced fermentation during production before the tea is exported. Thank you Su, for the clarification. I was in Guangzhou last week and made time to meet my tea drinking group during one afternoon. One of the tea buddy had bought an 80s liu bao tea to our tea drinking session. 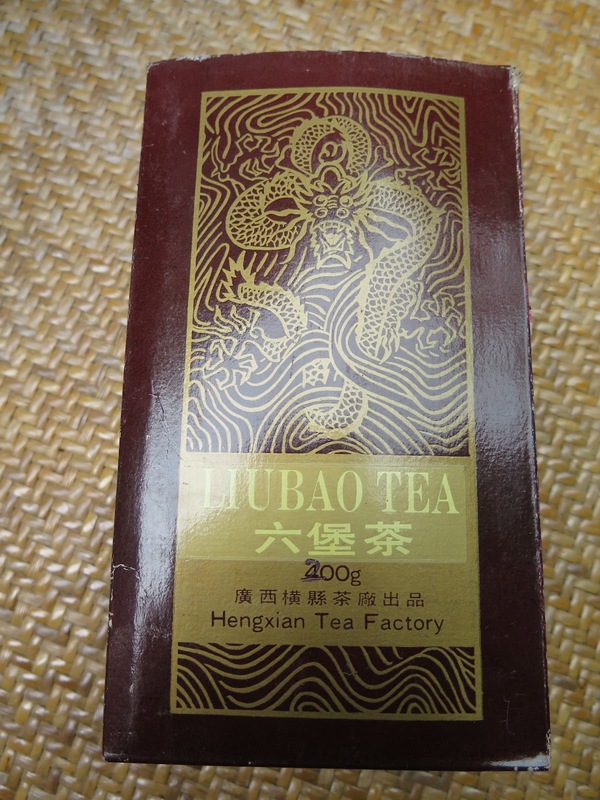 This liu bao tea was made in the 80s and I think it was meant for export outside China. There was, on the box, a panel in English explaining liu bao tea. My tea buddies told me, that during the 70s and 80s, liu bao tea was the main staple tea for the Guangdong and Hong Kong tea drinkers. Pu erh tea only gained popularity from the early 90s. Liu Bao tea is a black tea that is fermented for 2-3 months (like shou/ripe pu erh) before it is packed for sale. Larger quantities of liu bao are also packed in large bamboo baskets weighing up to 25kg and some of these baskets even found their way to Ipoh, Malaysia for the Chinese workers who were working the tin mines there. Back to this tea. This liu bao was manufactured by Hengxian Tea Factory. This tea is very aromatic and there was a pronounced woody scent in the tea. Very mellow and smooth, the tea easily brewed up more than 10 good infusions. You will have noticed from the pix that there are different teacups in this tea drinking session. My friends and I normally have our own teacups when we meet for tea. And…..my teacup is the biggest one. I must remember to bring a smaller one next time. I was on a business trip last month and I had managed to squeeze one afternoon in Kuala Lumpur to meet my old tea buddy Auhckw for lunch. As we were in the Kepong vicinity, Auhckw bought me to JDX teashop, the first distributor of Taetea (we tea drinkers call this brand 'Dayi') in Malaysia. This very big teashop is now transformed into a Taetea showroom. It is massive - a Dayi wonderland. It's much bigger than the Dayi shops I had visited in Guangzhou. I would recommend a visit for any Dayi tea drinker or collector if you are in Malaysia and get your Dayi tea refills here. Dayi tea is very popular among Malaysian tea collectors. Many Dayi tea friends I know, actually invest by buying cartons of Dayi tea and selling them for a tidy profit when the prices of their tea appreciates. I know that some of these older Dayi tea are re-exported back to China as well. 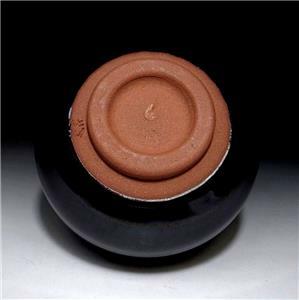 One of the main reasons is that the year-round hot and humid climate of Malaysia is conducive to pu erh storage and many tea drinkers think that a pu erh tea cake stored in Malaysia ages twice as fast than a same tea stored in China. Well I am happy that I am living in this region and I can easily have my fill of Malaysian stored tea. 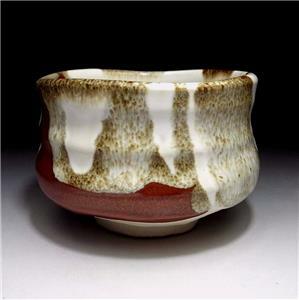 Tenmoku tea bowls are characterized by a thick glaze on the surface (both inside and outside) of a bowl. Tenmoku bowls had its origins in China, where Japanese monks had visited Chinese temples (experts think monks, during the 13th century, had visited Tian-mu temple in China, hence the name 'tenmoku') and bought back these tea bowls (and I imagine some Chinese tea as well) when they returned to Japan. Subsequently, these bowls were very popular with the Japanese and they started to make their own versions of tenmoku. I had purchased a few tenmokus. 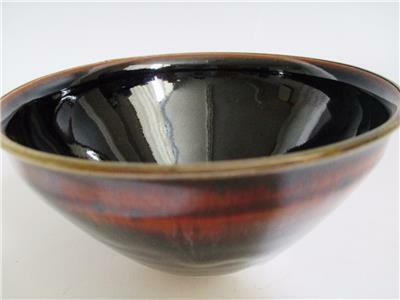 The top 6 pictures are Japanese tenmoku bowls while the last bowl at the bottom is made in China, where such bowls there are called Jian ware. 1. 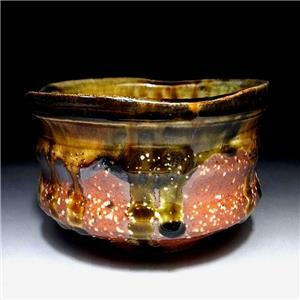 The glaze on the bowls were thickly applied and highly reflective. 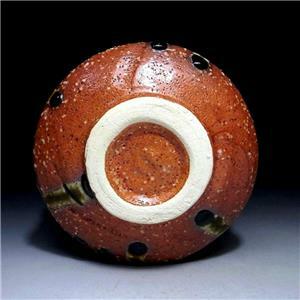 The presence of iron oxide in the glaze may cause, intentionally, beautiful patterns on the glaze after the tenmoku had gone through its firing process. 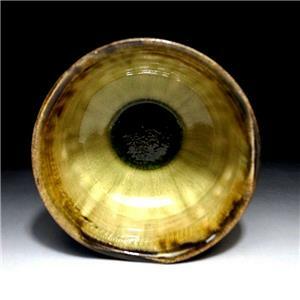 Depending on the heating and cooling times of the firing (baking) process, these tea ware will have very unusual and artistic results. 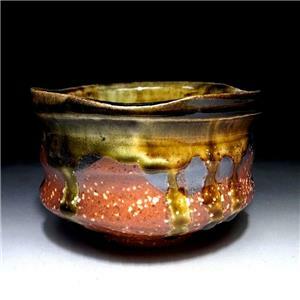 Pix 6 shows an oil spot glaze, known as yuteki. The pattern of the glaze on the last pix is call 'rabbit fur or hair' design characterized by very fine lines resembling the coat of a rabbit. Readers, please click on the pictures to have an enlarged view. 2. 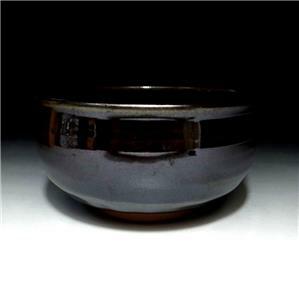 Some of the Japanese tenmoku tea bowls comes with a metal rim. These rims are usually made from silver. You can clearly see these metal rims in pix 4 and 5. Why a metal rim? 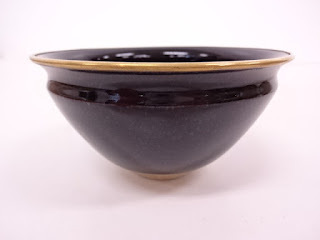 My best guess is the metal rim was made to protect the very fine and thin temoku bowl rim which may be easily chipped off during handling of such bowls. 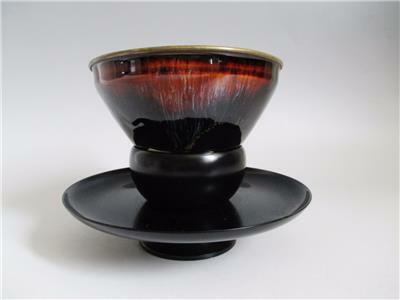 Rim chips may make drinking of tea from such bowls unpleasant and will affect the overall aesthetic appearance of these bowls. 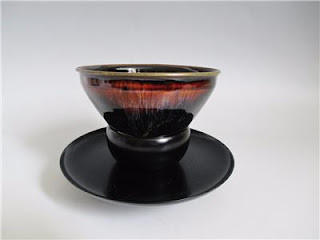 I found the installation of these metal rims to be high quality and it does not in anyway, affect me when I drank tea from such bowls. Almost unnoticeable. Did you notice the tea bowl holder in the first 3 pix? 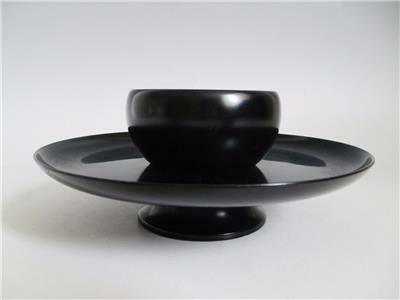 This is a tenmoku dai, a holder to rest the tea bowl. These dai may be made from wood or lacquered in this case. I suppose some of these tea bowls have such narrow bases or bottoms, and may cause the bowl to topple to its side, spilling in its contents if one is not careful and a tenmoku dai will help reduce such accidents. Drinking tea from these tea ware are very popular in China and Japan. These tea drinkers attest the tea would taste better in terms of aroma and taste. 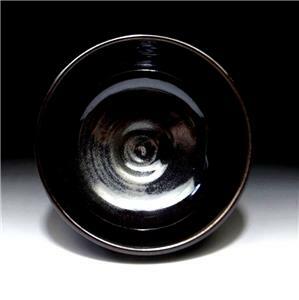 Moreover, the aesthetic factor will be turned up few notches when such bowls are used in a tea session. Time to drink my pu erh from a yuteki oil spot tenmoku.